Seems as though time just slides by beautifully when winter slips in. This was a work week for me, and the one day I had to drive to town to the “real” office was the day before the huge northwestern snow storm blew in. Lucky me! The rest of the week I worked at home, snug as can be in my little office with the wood stove cranked up high and the cat snuggled in next to me in his bed. Mo plowed a few times, I shoveled and ran the snow blower, and we hauled half a cord of wood to the porch, but the storm didn’t cause us a bit of trouble. I am working on a rocky soil problem, and my head is filled with stones, cobbles, boulders, and gravels of all sizes. Each of these has a specific size and description of course, and eventually I will get it all sorted out and plugged into all those nice little NASIS fields and someday someone will request some interpretations for the Knot Tableland and out will pop a nifty little report, generated specifically for their area of interest from the data we gather, refine, and populate. As I sit in the office fiddling with numbers, my mind wanders back to 2004 and 2005 when I was mapping out on the Knot Tableland, and dug a ton of holes in those stones, cobbles, and gravels and described those soils. It was hot and dry, and most of the time I was alone. That is the way we work in soil survey more often than not. So this week, my mind has been split between recalling those memories as I look at my old descriptions, and talking on the phone with the project leader in Klamath till my ear was sore. ( I gotta get another ear piece!) We resolved the issues, and on this Saturday night, two more soils are written, cleaned up, and put to bed in NASIS. Then, right in the midst of the worst of the windy snow, I got a call from my daughter Deanna saying that she and her husband were coming down the five and did we want to meet them for a short visit before they chained up to go over the Siskiyous. Wow! Deanna and Keith have their own truck and haul jet engines all over the country, but they haven’t been down this way in at least two years. I don’t get to see my daughter very often, so Mo agreed to drive, whiteouts or not, and we headed over the pass to Medford. We had a great visit at Shari’s, next to the big Pilot truck stop where they could park the rig. I even remembered to bring the sweater I am working on for Deanna to check the fit. It was perfect and she likes the colors. I still can hardly believe this little girl of mine drives that great big truck. Somehow, in the midst of everything else, remembering the last days of our trip home from the desert up the California coast just slid right by with an occasional thought, “Oh yeah, that!”. So here is the promised “rest of the story”. When we left Vandenberg, there was a bit of fog hanging around making the hills look mysterious and mystical. The route led through Pismo Beach, a beautiful place to spend some time, but since it was only 9:30 in the morning when we arrived and still quite foggy and chilly, we decided to continue on to San Luis Obispo. First I had to check out the local quilt shop, and with early morning traffic in the small town almost non-existent, we had no trouble parking the MoHo right in front of the store. I browsed through the windows, but decided that waiting another 90 minutes for them to open was silly and we continued on toward breakfast. Our route home from Vandenberg AFB could have been simply a run up the 101, but why do simple when challenging is an option. We instead decided that we were up for the winding beauty of California’s scenic coast highway 1. Listed in many places as one of the most beautiful drives in the world. Why in the world would we miss the chance to crawl along the steep cliffs overlooking the Pacific Ocean in a motorhome towing a car. One of my favorite restaurants along this part of the coast the the Apple Farm in San Luis. We were seated in the beautiful glassed in gazebo with brilliant sun shining in the windows framing the lovely hills surrounding us. As usual, breakfast was scrumptious, with home fries and “California Scramble” which included lots of spinach, artichokes, olives and other California stuff. I really appreciate my California upbringing and being exposed to things like artichokes, avocados, and olives as everyday food. I grew up eating lots of fresh stuff from the lush gardens and orchards where we lived that are now just pavement. We continued north to Morro Bay and our last chance to hightail it back over to the simpler route along 101. The sun was out, the skies were clear, and when we saw the sign saying it was only another 135 miles to Monterey we decided to go for it. It was a great drive. Winding and a bit challenging at times, but nothing too difficult. The only thing about this road that is bothersome is the lack of places to pull over and actually spend time. I was in the passenger seat, and the skies were a just a little bit murky from the morning fog, so my photos aren’t that great. Of course, with the proliferation of digital photography and google search, there are at least a bazillion photos of every single stretch of this beautifully amazing stretch of road. I even have some from other trips we have taken, so I wasn’t too concerned about missing out. In fact, it was nice just being able to do the white knuckle thing now and then without worrying about photography. Our evening destination was the Military Family Camp at Monterey Pines RV Park and Golf Course. This camp is on the grounds of the Monterey Naval Postgraduate School. We called ahead for a reservation, because even at $30 a night, that was cheap for anything else around that part of California. It was good that we did, because the camp was nearly full. Our rig is technically 26 feet long, and that is what I answer when asked when making a reservation. We were given a nice pull through site on the phone, but when we arrived we were told she had moved us to space 22. I think it was the shortest, tightest space in the park, and a big 40 footer was in our originally assigned space. After crawling around slippery ice plant to try to hook up, and struggling to get level, we decided that in the future we should say we are 30 feet long so we won’t get relegated to the worst sites in the camp! The campground is adjacent to a beautiful golf course, but the camp itself is really crowded and tight, and is backed up directly to the airport and hangars. Loud noise for much of the night, and the occasional bomb going off now and then made things interesting. We settled in, and decided to try to find a grocery store. Safeway was only 1.5 miles away, but my gosh, the traffic was horrendous! One of those things I forget about California until I get back there. We were glad for a nights rest and hookups, but might not try to come back to this one unless absolutely necessary. There aren’t any Passport America parks anywhere in the vicinity, though, so it was good for a night. The next day we decided to do another 250 mile run and spent some time searching around Streets and Trips, CampWhere, and AllStays for a place to spend the night. We considered trying to get as far as Trinidad and the free casino, but then found a beautiful little park right on the 101 just north of Willits. Creekside Cabins and RV Resort looked really great on the internet. I tried calling to verify the Passport America Park status, but no one answered so I left a message. After driving through the Bay Area, we were ready for a nice night in a quiet place. Winding down into a damp, dark canyon, we felt a bit of consternation, but thought maybe the park would be OK. The turn in came up suddenly and we pulled into the driveway only to discover a huge iron gate, tightly closed. It was dark and spooky there, even in the afternoon, but I got out and rang the bell. No answer. We were in a pickle because the rig was cocked at a weird angle and there was no way we would get the car unhooked and we couldn’t back up or turn around. I finally walked into the park and realized that this place might not be the best place to be. There were really old rigs with blue tarps, big dogs with spike collars, strange looking people, and a LOT of junk. I finally flagged down a somewhat “high” dude and asked him if he could open the gate to let us come in and turn around. He was hemming and hawing but then the camp host appeared, another strange looking woman with wild hair and a gazillion tats and piercings, and said we could come in and look around. One of the reasons we wanted the park was to see some TV that night, Mo was looking forward to one of the debates, and when this woman said, “Yeah we have maybe 6 channels”, we decided boondocking was a far better choice and we managed to get turned around and outta there! Whew! It was getting late and dark but we got back on the highway thinking we could find a casino, or a pull out or something. I had no cell phone signal, but unbelievably there was still a Verizon signal on the MiFi and I found a park about 40 miles farther up the road. We pulled into Richardson Grove RV Park a little bit later, settling in just before dark and hard rain started falling. We thought we had it handled when we left Monterey. I used all the tools available, found a Passport America Park, used the MiFi and GPS to find it, and still ran into the unknown factor. We still laugh about just how much different that Creekside park looked in person than it looked on the nice internet web site. By the way, it was no longer a Passport America Park, either, and the fees would have been 40 bucks for one night if we had decided to stay. We surely were glad to return home the next day to our beautiful, safe, cheap, gorgeous space A12 at Harris Beach State Park in Brookings. Ahh, home, or almost home. It was so good that we settled in for two nights and three days before packing up the Tracker, putting the MoHo to bed in the storage building, and traveling home to Rocky Point. As I sit here at my desk in Rocky Point, it is hard to believe that less than a week ago I was ambling along the coast highway in brilliant sunshine. The sun is brilliant out my window today, but it is reflecting brightly off the first significant snowfall we have had since October. I say significant, but I think it is hardly more than an inch or two out there, nothing to worry about, but also nothing to help with the local scanty snowpack. Our time in Desert Hot Springs was perfectly incredible, with sunny skies and warm temperatures the entire time we were there. Our trip home up the coast was equally as brilliant, with a bit of morning fog here and there but not a drop of rain and not even the typical coastal overcast to mar the warm days. We only needed a jacket now and then to ward off the slight chill of ocean air and breezes. We left the desert on a sunny morning, late enough to miss the worst of the LA traffic and yet early enough to spend a couple of hours on a sweet little side trip without compromising our planned nightfall at Vandenberg Air Force Base. I was born just north of Pasadena and raised in the adjacent mountain town of Sierra Madre. LA smog and traffic, and the crush of people drove me out as a young person, but there are some sweet memories of the area as well. One of those memories include the solid coziness of the modest bungalow homes on the shady oak lined streets. I always dreamed of having one of these Craftsman bungalows, with trapezoid pillars, wide porches and big oak doors. I remember the sunlight playing on my gramma’s hardwood floors and the smell of baking cookies. Something about a Craftsman bungalow really takes me back to a life with different values than what we have today. No McMansion for me, please, just a perfect little bungalow. Ah well, so far that dream is one I have had to set aside, but I still love to cruise old towns looking for the perfect dream Craftsman. Bungalow Heaven was a place on my want to visit list for a long time, and on this bright sunny California morning we parked the rig at a shopping center and took the time to drive to the approximately 12 square block area in Pasadena that has been set aside as a “Landmark District” I wasn’t disappointed, although I had forgotten how dark some of these houses can be with their overhanging roofs and wide covered porches. I guess sunlight isn’t in short supply in Southern California and the shade of the huge old live oaks and dark porches are a welcome relief. The rest of the day was uneventful, with amazingly light traffic on the freeways, from the 210, to the Pasadena Freeway, to the Ventura Freeway, across the Golden State, and all the way to the 101. Piece of cake!! We thought about staying at one of the California State Parks along the beach, but they are expensive ($35 per night with no hookups) and crowded. Instead we just kept driving north to Vandenberg Air Force Base and the Military Family Camp we knew was waiting. By the time we got there, most spots with electric were full, and it was a bit confusing to figure out where to go since the camp host was nowhere to be found. We opted instead for the $8. per night overflow camping where we could be away from the main part of camp and sleep peacefully. It was a bit like boondocking but with the extra safety factor of being on the base. “On Base” however, had it’s own story! We read on the website that we should be prepared for a rig inspection and that we needed to go to the Lompoc gate rather than the main gate since they wouldn’t do inspections at the main gate. We arrived at the gate around 4, and after a bit of waving and gesturing, we followed the instructions of the officer and moved through the inspection area. I guess we didn’t need an inspection after all. Ambling slowly through the base, we were trying to find the campground when the dreaded blue lights started flashing behind us. Mo couldn’t figure out what she had done, since she is especially careful on any kind of military base, but sure enough he pulled us over. We were informed that we had driven through the inspection station against the orders of the officer in charge and were to be escorted back to do it properly. The officer and his cohort led us through the base, to a proper turn around and then all the way back to the Lompoc gate. That was a bit embarrassing! It seems that a wave through didn’t mean what we thought it did! The inspection itself was strange. Several security folks told us to undo all the rig compartments (on the outside) and then they ran mirrors all under the bottom of the rig. They told Mo she had to stand in the holding room, and that I had to get out of the rig. When I told them not to lose the cat, they relented and said, “Oh fine, you can stay in there”. Funny part of the whole thing is that they never once looked INSIDE the rig at all! We passed the inspection and drove once more through the base to find the Family Camp. It turned out to be a decent place to spend one night, but I don’t think I would want to stay here for any length of time. The only good part is that it is conveniently located to the coast, just 41 miles to Pismo Beach, and about the same to Solvang. It is cheap in a part of the state where there isn’t much available, even with our Passport America pass. After reviewing Streets and Trips and doing some internet surfing (I LOVE the MiFi) we settled in to a nice supper and an early evening of reading and sleeping as the fog rolled in and muted the waxing moon. Instead of traveling fast, we decided to go just another 200 miles the next day to another family camp in Monterey. Next: Monterey Pines RV and Golf and don’t depend on what you see on the internet! It is five am and I have been awake for awhile now, who knows why. We have been traveling for the last few days, choosing to follow the coastal route through California north from the desert. We have taken our time, ambling north at a rate of about 250 miles per day, taking advantage of Military Family Camps and Passport America to park for the night in reasonable comfort. As usual, when I can’t sleep, I thought perhaps I could write about something with a bit more depth than I am inclined to write later in the day when real life is closer than my dreams. For many days now, I have been thinking about what to write about Slab City, otherwise known as the Slabs. It is easy to post the photos, to write about the physical reality of the place. Many folks on the road in this part of California have done just that. The physical reality of the Slabs is simple. It is located in a wide open part of the desert east of the town of Niland that has little to offer except simply space. On a section of state land that once held the Camp Dunlap Marine Training Center, there is now a free boondocking oasis for RV’rs of all kinds. At first glance, entering the area is somewhat shocking, depending on your point of view. Folks who come here seeking refuge because they know about the culture will feel welcomed and safe. Mid America types of RVrs in their big rigs coming here for the first time might be overwhelmed by the apparent lack of any sense of beauty or order. Boondocking types who seek wide open empty spaces might think the place is much too populated. Boondocking types who love the Quartzite atmosphere of daily social gatherings of like minded folks will love it. We had no plans to boondock in the Slabs, but I wanted to see it. Occasionally I read about folks coming here with their thoughts and experiences, but my view of Slab City has been forever altered by the writing of just one man. Randy, of the Mobile Kodgers, let me see this place with completely different eyes than I would have ever seen on my one afternoon drive-through. 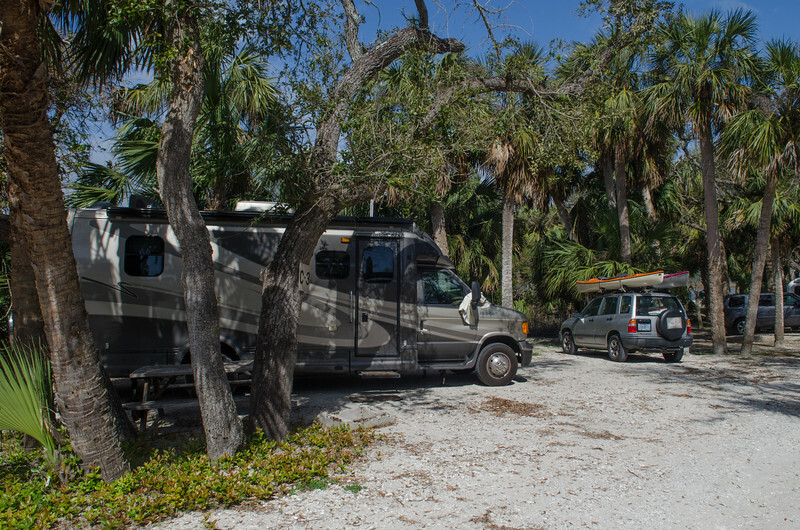 Randy’s blog isn’t your everyday blog of the typical RVing full-timer. Much like Debra in Bisbee, Randy says things that might make some people a bit uncomfortable, but he tells stories like few people are willing. Instead of simply gawking, Randy makes the effort to dig in deep and get to know a place and the people who inhabit it. I think it is because of Randy’s blog that I have been unable to actually write about Slab City, knowing that I can’t come close to expressing what Randy has found and the stories behind the trash and the once homeless lost people who have chosen to live there. If you have an opinion of the Slabs and haven’t read Randy’s blog, check it out and learn something. I surely did. After a bit of a disappointing drive around the Salton Sea, we saw a sign for Niland and Salvation Mountain. Mo had no idea what awaited us, but I told her that we needed to go there and see it in person. We took the gravel road east and in a short time the multicolored painted mountain appeared. Salvation Mountain is a story of it’s own, again Randy has written about the artist in depth, in ways you might not find on websites telling the story of this amazing piece of crazy folk art. I cannot even come close to writing about Leonard Knight the way that Randy has. Here is his story about the creator of Salvation Mountain. It was with awe and respect for all the different people in the world that I walked through the nearly psychedelic interior of the hill. We walked past great piles of paint buckets donated by every major paint company in America into one man’s vision of the message of God’s Love. Deep inside we found four young folks and their dog, taking photos, and they asked me to get a shot of the four of them. They were friendly, open kids, who had driven from Tucson to spend New Year’s Eve at Slab City. They looked at me when I asked why they were here with surprise, as if I should know that the New Year’s Eve party at the Slabs was something not to be missed. While one young woman casually rolled a joint, they told me that Slab City was a dummied down version of Burning Man, only it lasted all year long. There are no police here, and rules of any kind are conspicuously absent, an important feature to folks who choose to come here and stay. Dogs run freely, rigs range from huge Class A’s to ancient trucks covered with folk art. There is a library and an internet café, tucked away in old buses or tin shacks behind cape verde trees. There is trash everywhere, and much of the trash has been converted to art. In the midst of the dusty dirt roads, we suddenly realized that an airplane was landing in front of us, and like the other trucks driving around, we pulled over to the side of the road to let it land. The pilot of the small plane taxied up to his big Phaeton, greeting some fellow campers. No rules. I am pretty sure that Mo and I will not ever choose to boondock here. Our vision of boondocking is more on the level of wide open and silent, like the area behind the Alabama Hills in California, or the Top of the World Highway in Alaska. We have parked in Quartzite, but not during the high season, and our idea of fun socializing is more often one couple at a time rather than big gatherings of happy hour get togethers. Still, I am so glad I got to see this place, had the chance to walk inside Salvation Mountain rather than just look at photos, had the chance to watch a little plane land on the dirt road, and to see the myriad types of shelters that so many people call home. I am glad there is a place like this in the world for those who choose to be there. The sunshine has been a welcome gift here in the desert. The days have been in the 80’s, but I have never felt uncomfortably warm. Long lazy afternoons are spent relaxing in our lounge chairs in the shade of the MoHo with a book or some knitting and sporadic conversation now and then. Our plans for this day were simple. We wanted to go on a nice hike early enough to avoid the mid day heat. The Gabby Hayes trail was Paulette’s favorite so we decided to give it a try. The route to Palm Desert is familiar to us now, and once again we trundled off west on Dillon Road to turn south to cross the interstate to the more populated side of the Coachella Valley. The City of Palm Desert has an extensive trail system, and the Gabby Hayes trail is one section that is dog friendly. The trail was marked well at the beginning, but not so clearly on the trail, so I was glad that I paid attention to the general route since the several forks are not marked and lead into areas where dogs aren’t allowed. We hoped for a three mile hike but I don’t think that the loop we did was quite that far, maybe two miles or so. It was a nice trail, however, with view of the valley below and a well worn path with comfortable switchbacks. By the time we reached the Engstrom Point shelter, Abby was ready for the cool bubbling water just at perfect doggie height. Sitting in the shade of the palapa we enjoyed the view of the city below us. There are a LOT of palm trees in Palm Desert, and they are not the native palms at all. We could see a road leading south into the mountains, and our friendly local, also sitting in the shade, told us it was Highway 74. Ding! Both of us suddenly remembered that the Pines to Palms Scenic Byway was on our list of things to do when we were here last year; a plan that was completely thwarted by the heavy rains and snows in the mountains that closed the road. There was no such problem this year, and in minutes we were traveling south to the infamously curvy, steep road. I didn’t bring any maps, but we had the phone, and the garmin was tucked away under the seat from the last local outing. I was really glad that we weren’t trying to go up that road in the MoHo! It was seriously steep and narrow, breathtaking views of the Coachella Valley below and even on a Wednesday morning, the traffic was fairly heavy. We really had no idea where the road led, except I thought I remembered something about Idyllwild. Sure enough, we went right through the tiny mountain town. As a kid in the 50’s I would come to church camp at Idyllwild and as we passed through town I saw the old sign for Idyllwild Pines Camp and Mo pulled in. There were the old bunkhouses, and the main hall where we ate meals and did crafts. I think I was ten the first time I camped here. It seemed so exotic and remote, so wild and mountainous to me then. Actually, where I live now in Rocky Point is much more wild and remote. 56 years ago, though, I had no clue what life was going to bring my way, I just knew I wanted to get out of LA, somehow, anyhow, I knew that even at ten years old. Our route led us in a big circle, and we stopped at the overlook toward the south and west to see San Diego in the distance and then marveled at the south facing cliffs of Mt San Jacinto, the same beautiful mountain that we see from our spot in Desert Hot Springs. The ride down the hill toward Banning was also breathtaking, with a drop of a few thousand feet in just a few miles and some more narrow, winding highway. We reached the Palm Springs exit in late afternoon, hungry of course since the trip was unplanned, and decided it was time to try out Rick’s recommended Palm Springs Deli, Sherman’s. The sun was still hot and we couldn’t leave Abby in the car so I planned to pick up something to go. Instead, the patio on the shady side of the restaurant was dog friendly, and we settled in to a nice table with a great view. Of course, the view wasn’t of mountains or valleys, but of local colorful folks having a late lunch/early supper right along with us. Palm Springs is definitely a great place for watching people. Sherman’s was delightful as well, with New York style pastrami and corned beef, but I only had the free pickles and a small scoop of potato salad so I could try one of the mile high cakes. The desserts at this place are huge, and the carrot cake was quite delicious, although I think there was more frosting than cake! I will say I took home a berry cobbler for breakfast that was a pretty big disappointment, so don’t expect all those desserts to be as good as they look. However, the pickles are the best I ever ate, bar none, so don’t miss them. Back on the road crossing the valley, we tried a different route. Somehow, for reasons known to no one, the overpasses of I-10 have been under construction for a very long time. Last year when we were here, it took forever to get back and forth between the two sides of the valley. We attributed it to the weather. This year, all the main roads across the highway are STILL under construction. Ah well. We aren’t in any hurry to get anywhere at all. That’s how it goes in the desert sometimes. Start off on a morning walk and who knows where you might end up. Last year when we were in Desert Hot Springs, Rick and Paulette were still tucked away at home in British Columbia, but since I follow Rick’s blog I knew that this time our visit would hopefully include a meeting with the two of them. I emailed Rick and we said we would catch up with each other sometime during the week. Rick didn’t waste any time and as we were relaxing with tea yesterday morning I heard the sound of a diesel truck slowly passing our site and looked outside to see a familiar face. Rick was hunting us down! As is so often the case with RV bloggers, it was instant recognition and familiarity. We sat in the warm morning sun for awhile visiting and making plans to get together on Monday night at a local restaurant. After our day circling the Salton Sea we were happy to spend Sunday relaxing, swimming, going for some park walks, and for me, knitting. I will be working on my daughter’s birthday sweater for a very long time. KarenInTheWoods saw a comment of mine regarding sock knitting and sweetly sent along a sock pattern to me. She called it a simple pattern, but I don’t exactly think it is THAT simple, Karen, but Thank You!! I’ll keep working on the sweater and try knitting up these fat warm cozy socks next winter. Karen mentioned that she loves to knit while riding along in the motorhome. I love that as well, although the bumpy California roads have made that attempt a bit awkward. The warm weather and gorgeous sunshine is conducive to real relaxation, and we planned another day of the same on Monday so that we could watch the Rose Parade and then the Rose Bowl with our home team, the Oregon Ducks actually winning the Rose Bowl. Fellow blogger Merikay is actually in Pasadena seeing the parade and the game and I am looking forward to her stories about that fulfilled dream of hers. After the parade and before the game we decided to drive out Dillon Road to the east to find Blair’s RV shop, highly recommended by Rick for obscure RV parts and an extensive knowledge base tucked away in the owner’s head. We found the small part we needed to fit the smaller than usual sewer pipe at Catalina and were on our way farther east to check out Thousand Palms Oasis. Our plan was to hike with Abby, but even on the east side of the Coachella Reserve we found signs saying “No Dogs”. Ah well, there are lots of other places where we can go with Abby and tomorrow we will head for one of them. Mo and I both love roads that wind off into nowhere and as we drove back north toward Dillon road, we found an old worn out once paved track leading up into the hills. Let’s go! The road was rough, but the Tracker can handle that and we followed the path through the desert. The desert seems to be a very popular place for people and guns, because scattered along the road were several groups of people shooting. I noticed most of them had targets that looked like human silhouettes, and while shooting at bottles or bulls eyes seems innocuous enough, those human targets really bother me. The road looked like it would wind back toward Indio Hills but instead we ran into a complete dead end right in the middle of a large group of young, somewhat rowdy looking shooters. They all had plugs in their ears and basically ignored us except for some irritated looks as we attempted to turn the tracker around on the half lane dirt track. I had a close up look at the guy’s pistol, black and pretty scary looking. We found several places that looked as though they might be great boondock sites, but I didn’t think we wanted to compete with the shooters or listen to the gunshots all day long. The desert has an earned reputation as a haven for independent sorts of people that don’t particularly like rules and treasure their freedom. My favorite of all time, Ed Abbey, was one of those types, as are these gun toting shooters. Philosophies as wide apart as night and day, and yet both still at home in the desert. Trundling back to our safe and sane site at Catalina, we turned on the game and spent the rest of the afternoon cheering along (and sending little encouraging emails to Russ) when the Ducks kept getting touchdowns. The game started at 2 and our dinner get together was scheduled for 6. It was an exciting game, with each team scoring like leap frogs, but the Ducks carried it off in the end. Our only problem was we had a half an hour drive to Palm Springs and had to leave during the last four minutes of the game. I fired up the phone and Mo fired up the radio and we managed to finish out that last four minutes while heading for town along Dillon Road. Downtown Palm Springs was all lit up with Christmas lights and people were walking the streets as usual in the warm desert evening. Parking wasn’t a problem on a side street and we saw the smiling faces of our new friends waiting in front of the historic restaurant. Rick took some great photos and wrote about the restaurant as well, so I won’t try to do it all over again. I will say that we had a great time talking about some of the similarities and differences between our two countries. My favorite part was learning that watching American politics is a spectator sport in Canada! Of course, Paulette and I share the delight of daughters, she has four and I only have three, and each of us has only one son. Discussing adult children and their various life choices made for some funny observations for all of us. Paulette is a lovely person with a great blog of her own all about her quilting passion and I so enjoyed having time to visit with her. I must say that meeting Rick was wonderful. Back when I first discovered a blogging community, Laurie pointed me to Rick’s tips about how to manage blogger and blogging in general. I learned a lot from Rick, and he has never failed to almost immediately answer any question I have asked him via email with excellent instructions. I discovered in person a kind, funny, easy going man who is willing to spend time writing about stuff that many of us haven’t a clue about in a way that is understandable. There are times when Rick’s instructions get right to the point of some hidden trick and I really appreciate that he takes the time to put it out there.